Speaking ahead of Iran nuclear talks on Sunday, Russian Foreign Minister Sergey Lavrov told journalists he is “not paid to be optimistic.” Though yet another deadline to reach a deal is fast approaching, no decision was announced over the weekend. The top Russian diplomat held a bilateral meeting with US Secretary of State John Kerry on Sunday in Switzerland's Lausanne, where several world leaders have been working hard to hammer out a final decision on Iran's nuclear program before the looming deadline of March 31. When asked by a reporter whether he was optimistic about the possibility of the deal, Lavrov said: "I'm not paid to be optimistic." Kerry carried on with the joke, saying "You are not paid enough to be optimistic." #Iran talks humor: Q: Are you optimistic? Lavrov: "I'm not paid to be optimistic." Kerry: "You're not paid enough to be optimistic." Earlier in the day, Lavrov also entertained the media and his counterparts ahead of one-on-one talks with the Chinese Minister of Foreign Affairs Wang Yi. 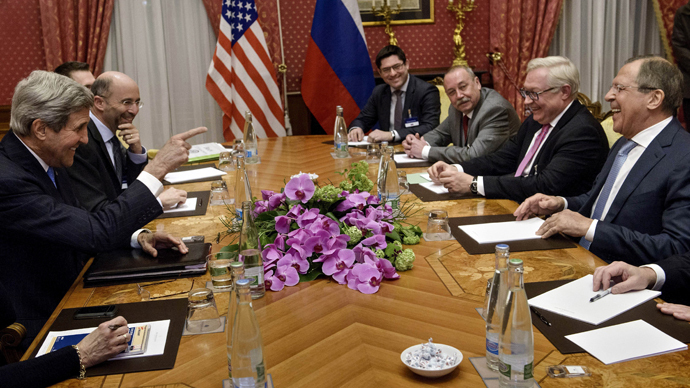 Upon entering the meeting room, Lavrov noticed that there were "too many bottles" on the table. "Two bottles – one glass. Discrimination for the glasses!" the top Russian diplomat joked. #US journo covering #IranTalks to #Lavrov: r u optimistic abt a deal? Lavrov: I'm not paid to be optimistic. Stupid question, smart answer. A number of meetings were held in Lausanne over the weekend, organized in the framework of a new round of talks between Iran and mediators with the P5+1 group – Iran, France, the UK, US, Russia and China, plus Germany – to try and overcome an impasse in the nuclear talks. Despite the current round of negotiations going on for 18 months and already missing two deadlines, the participants of the Lausanne talks expressed cautious optimism about a possible breakthrough. "It's going alright. We're working," Kerry said earlier on Sunday, after a meeting with Iranian Foreign Minister Mohammad Javad Zarif. He later added that reaching a deal with Iran is doubtful at this stage. Meanwhile, Kerry told RIA Novosti that he discussed the situations in Ukraine, Yemen and Syria with Russian Foreign Minister Sergey Lavrov. “We had a good discussion with Lavrov,” he said. The issue of sanctions against Iran has also not been resolved and remains a key obstacle at the talks, TASS quoted an Iranian diplomatic source as saying. “Some members of the Iran Six are proposing absolutely unrealistic options, which are unacceptable to us,” the source said. “We are trying to align our positions closer on this aspect.” Sanctions are “dragging out the process,” the source added. On Saturday, EU foreign policy chief Federica Mogherini said “We have never been so close to a deal." While briefly talking to reporters in Lausanne, the EU diplomat also said there were still "some critical points that need to be solved." The question of being optimistic seemed to be one of the most popular among journalists covering the talks. When it was Mogherini's turn to answer, she said: "You're always optimistic, otherwise we wouldn't be here." The talks in Lausanne have confirmed "our concerns and even worse," Netanyahu told Israeli public radio on Sunday. Iran was placed under harsh international sanctions after it was believed the country was developing its nuclear program to make an atomic bomb. Those claims have been repeatedly denied by Tehran, which says it needs nuclear energy purely for civilian purposes. The settlement now being discussed in Lausanne would reportedly see Iran scale down its nuclear program and agree to unprecedented inspections of its activities in the field, with the UN lifting or easing its sanctions against the country in return. While the sides hope to agree on broad outlines for an accord by midnight on Tuesday, no deal was announced over the weekend. Sources in Lausanne said the world leaders will stay in Switzerland until at least Monday night. "As of now, there is an understanding the ministers of both the six countries and Iran will stay here until tomorrow [Monday] night," an Iranian diplomatic source told TASS news agency on Sunday, adding that the talks might also continue on Tuesday, "depending on the atmosphere."